History has shown us that retail investors as well as so-called market professional are usually wrong about the direction of the stock market. So betting against them is a way to help you make money. Strong evidence of that comes from the Investor Intelligence Bull/Bear poll of more than 100 stock market writers who historically are wrong about market direction because they are driven by emotion – very fearful at market bottoms and overly elated at market tops. For instance, in late December, just as the market was about to rebound, the Bull/Bear spread was – 4.7%, meaning bears out numbered bulls. That’s not an anomaly. Negative spreads traditionally have occurred before a rebound. The last time before December was in early 2016 when the spread was an even wider -14.5. That also proved to be a buying opportunity, as was November 2008 when the negative spread was -26.8% and at the index low in March 2009 when the spread was – 20.8%. Conversely, we use positive spreads (bulls outnumbering bears) of over 30% as elevated risk, while those above 40% call for defensive action. Where are we now? 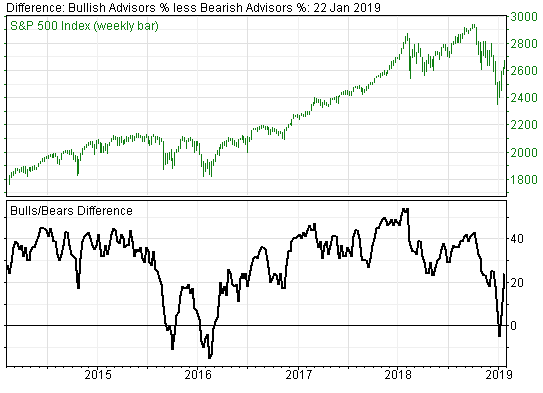 The Bull/Bear spread has jumped from +16.9% a week ago to +24.1% In other words, now 45.4% of the professional market prognosticators are bullish and 21.3% bearish. That +24.1% spread is not a sell signal but is moving in that direction given the huge surge of optimism from – 4.7% in late December that in our view has been mindlessly triggered by the recent market rebound, and despite troubling economic warnings from Davos, as well as economic woes that could result from the longest U.S. government shutdown. Moreover, we expect more down moves. Stocks are historically too high. Typically bottoms are created with a series of corrections. The fourth quarter correction down move is only one of many more we expect before stocks reach oversold levels that would trigger a durable, long-term rally. In other words, sentiment is a powerful contrarian tool to help investors make better decisions freeing them from the noise of experts who usually get it wrong.